So serving pork chops with applesauce is a thing. Like, a big thing. And this is the fresh and ‘gourmet-ized’ version of pork chops and applesauce. 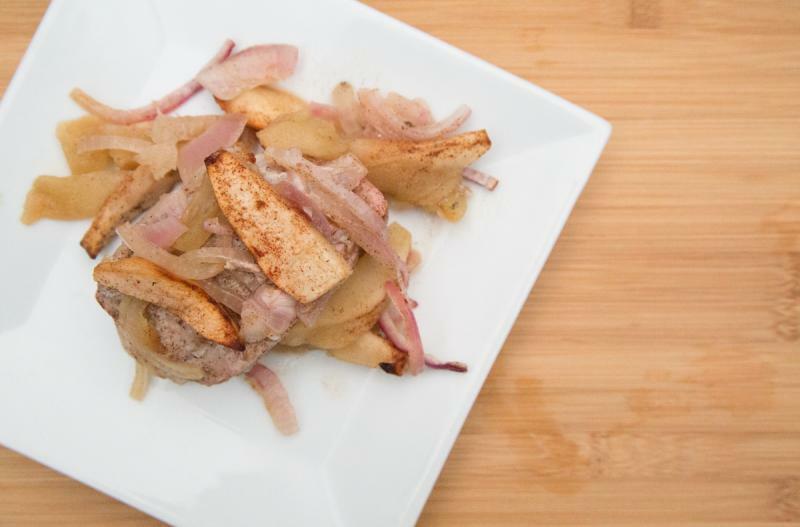 Pork chops, covered in cinnamon dusted apple slices and red onion strips, and baked to perfection. 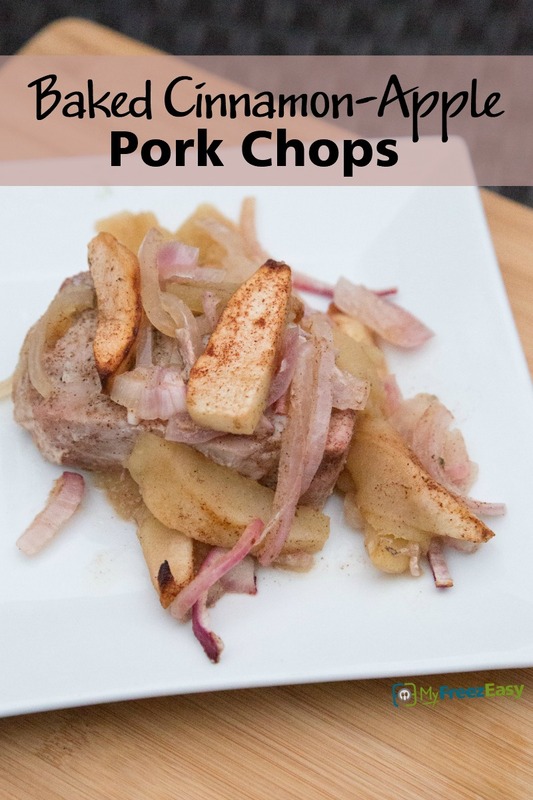 We adore these pork chops and I hope you do too! Preheat oven to 375 F. Lightly grease a 9x13-inch glass baking dish with non-stick cooking spray. Place the pork chops into the baking dish and season with salt and pepper. In a small mixing bowl, combine the brown sugar, cinnamon, nutmeg, ginger and salt. Toss with the apples, then pour the cinnamon-apple mixture over the pork chops. Bake in the preheated oven for 25 to 40 minutes, or until pork chops are cooked through. Cooking time will depend on the thickness of the chops. Serve Baked Cinnamon-Apple Pork Chops with salad and dinner rolls. Slice 2 small red onions. Peel and slice 8 small apples. Toss the sliced red onion and sliced apples in mixing bowl with 2 Tbsp lemon juice. In a small mixing bowl, combine the 4 Tbsp brown sugar, 2 tsp cinnamon, 1 tsp ground nutmeg, 1 tsp ground ginger, and 1 tsp salt. Toss with the apples and red onion slices. Recipe is gluten-free when served with gluten-free sides, like rice. Thaw and bake at 375 F for 25 to 40 minutes, or until pork chops are cooked through. Serve over dinner rolls and salad.